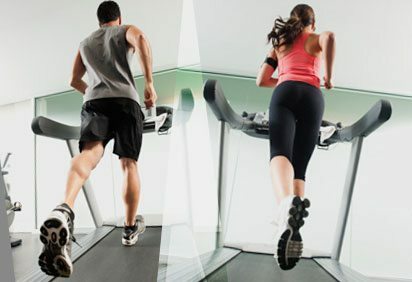 Whether they want to lose a few pounds before the high school reunion or are trying to get in bikini shape for an upcoming beach trip, people resolve everyday to stop being sedentary and get back inside the gym. But too many go into overdrive, trying to lose weight too fast and pushing themselves too hard. It’s a phenomenon called crash fitness, and it can leave anyone sidelined with an easily preventable injury. Here are the top five crash-induced injury zones and how to make sure you steer clear. Make sure your knees are bent when you’re lifting weights, and talk to a Gold’s Gym personal trainer if you have any questions about technique. Increase your core strength with basic bridges and half Superman lifts. Basic bridge: Lie on your back, knees bent with arms comfortably at your sides. Press into heels and raise your hips, taking the pressure in the upper shoulder. No pressure should be felt in the neck or back. For advanced positions, try touching your fingertips to the back of your shoes or clasping your hands behind your back and drawing your shoulder blades together. Half Superman: Lie facedown with your arms stretched above your head and your feet about hip-width apart. Keeping your neck straight and your eyes on the floor, lift your arms and torso as far off the ground as you can. “Your calves are much stronger than your shins—and that imbalance can really beat up your shins, especially if you have improper form when you run or walk,” Reames warns. If you get shin splints frequently, think about asking a trainer to check your form. In addition, work on strengthening your shins, which you can do while sitting: Simply draw your toe toward your knee while keeping your heel on the ground. Make sure you aren’t overdoing resistance, and keep your wrists straight and properly aligned when doing arm workouts. “If you are curling, pulling or pushing anything, make sure your wrists are straight,” Reames advises. Make sure to take proper care of your body, especially your muscles. You can give yourself a mini-massage almost every day using a foam roller (the type you find at most gyms) and a myofascial release approach; it’s like therapy for your muscles. “These moves roll out trigger points—or knots, as we normally call them—and help cure tight muscles and relieve sore ones,” Reames says. “Do them post-workout, and the recovery process for your body starts faster because you’re relieving tension and increasing circulation.” Make sure to take your time and roll as slowly as possible. Lie on top of the foam roller, facing down with the foam roll under your mid-thigh. Beginning at mid-thigh, roll down to just above the top of your knee, then up to the top of your hip area. Move on to the glutes. Sit down on the foam roller. Focus on one side of your bottom by crossing one leg over the other. Slowly roll from the bottom of your glutes through to the top. Really try to use your weight to push down into your muscle. Repeat on the other side. Take care of your iliotibial band. This muscle that runs down the outside of your leg is responsible for hip rotation and knee stabilization. Lie with the foam roller under the side of your right leg near the top of your hip; roll down to the side of the knee, then back to your upper hip. Repeat on the left leg. Focus on your middle to upper back. Lie faceup with the foam roller below your shoulders. Bring your elbows together in front of your chest to really push out your back muscles. Roll down so that the foam roller reaches the middle of your back, then roll back up to your shoulders.